Date of birth unknown. His first stage name was Asai Kunigorô. He became disciple of Asao Tamejûrô I and switched his name to Asao Kunigorô I. He became katakiyaku in 1775 and died in 1776. His haimyô was Kishô and he was the elder brother of Asao Kunigorô II. The actor Kataoka Nizaemon VII held the name of Asao Kunigorô II from 1777 to the 1st lunar month of 1788. The actor Asao Kunigorô III held this name from 1798 to the 1st lunar month of 1835. Date of birth unknown. 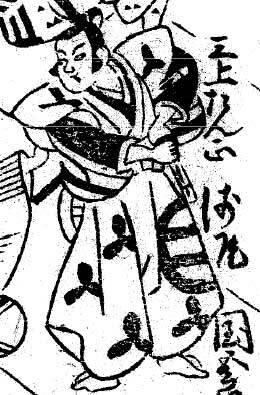 Disciple of Mimasu Mitsugorô, his first stage names were Mimasu Monnosuke and Mimasu Kanjûrô. He became disciple of the star Nakamura Utaemon III and switched his name to Nakamura Kanjûrô at unknown times. It may have become disciple of Asao Kunigorô III (assumption to be proved). He took the name of Asao Kunigorô IV in 1839 but held it for a very short period of times as he died in 1840. He was a katakiyaku actor. Date of birth unknown. He started his career in Kamigata, performing under the name of Mimasu Kanzô II (relationship to the Mimasu clan unknown - Mimasu Kanzô I was the younger brother of Mimasu Daigorô I). He became a disciple of Asao Tamejûrô III and received the names of Asao Sanpachi and Asao Yamamichi at unknown times. He joined the Arashi clan, led by Arashi Rikan III, and took the name of Arashi Kan'emon for a while. He went back to the Asao clan and took the name of Asao Umebachi. 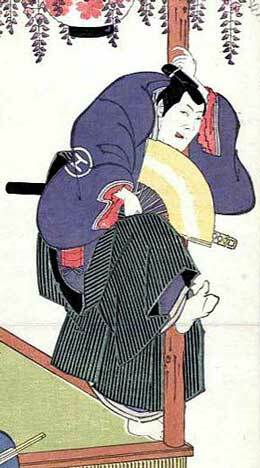 He settled in Edo at unknown times and was finally allowed to take the prestigious name of Asao Kunigorô V either in 1844 (according to the "Kabuki Jinmei Jiten") or 1846 (according to the Ritsumeikan University Actors Database). He died in 1877. This actor excelled in katakiyaku roles in sewamono and oyajigata roles in his latter years. It is worthy to note that he was also called Ikushima Kan'emon ( ).